The Island of Mexcaltitán is without a doubt one of the Riviera Nayarit’s hidden gems. A tiny island in the municipality of Santiago Ixcuintla with only 1,800 inhabitants, its name comes from the Mexcalli Náhuatl words “mezcal” and “titlán,” which mean “riches and abundance.” According to legend, Mexcaltitán is the birthplace of Mexican heritage: this was the starting point of the ancient Mexica’s long journey that ended when they founded the great city of Tenochtitlán. Historians say they have solid proof this is the mythical Aztlán, the birthplace of the Aztecs. Decreed a World Heritage Site in 1986 Mexcaltitán stands out for its unique architecture, its picturesque colors and its charming tile-roofed houses. During the rainy season the citizens use boats to navigate the streets on particularly wet days. Their economy is based on shrimp fishing, though they also create lovely handicrafts from the surrounding mangroves, as well as barcinas, spheres created from rough linen and palm fronds, where they store dried shrimp. Mexcaltitán is also home to one of Nayarit’s favorite dishes, the pescado sarandeado, or fish grilled with mangrove leaves. This dish is so representative of the island that it’s the only place that has permission to use these leaves for cooking. Another traditional dish is the taxtihuil, basically soup with shrimp balls. Another important historical landmark sits at the heart of the island: a beautiful church and El Origen museum, filled with archaeological remnants of Mesoamerican cultures. 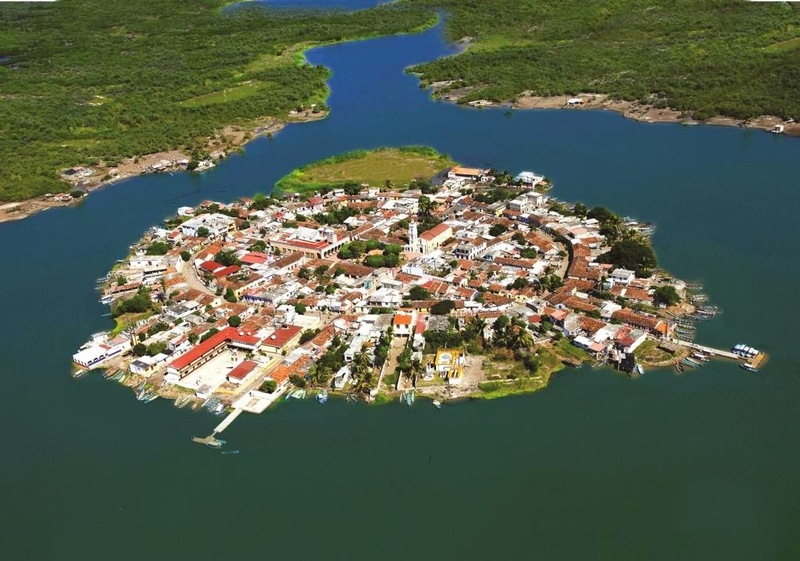 The Island of Mexcaltitán is a jewel in the crown of the Riviera Nayarit. Its unexpected surprises will delight the visitor who searches just off the beaten path—and is rewarded with exceptional experiences. hotels or places to stay on the island or nearby? Where and how do you get to this island? What hotels or accomodations are located on this island? Has anyone experienced it? There is a pretty small hotel in the island : Hotel Ruta Azteca, I have not stayed personally so i cant say if its any good. Santiango Ixcuintla about 20mins away has some moderate hotels, but same as above, I have not stayed personally. San Blas is the best option! its about an hour away, so ideally stay at Hacienda Flamingos Hotel or Garza Canela Hotel and from San Blas to a day trip to Mezcaltitan.